Over the years, I have flown 1.7 Million miles as a passenger (I state this both by my rough estimate and the fact that major airlines do keep and disclose these statistics to their frequent flyers). Fortunately I have no “horror stories” in that time. 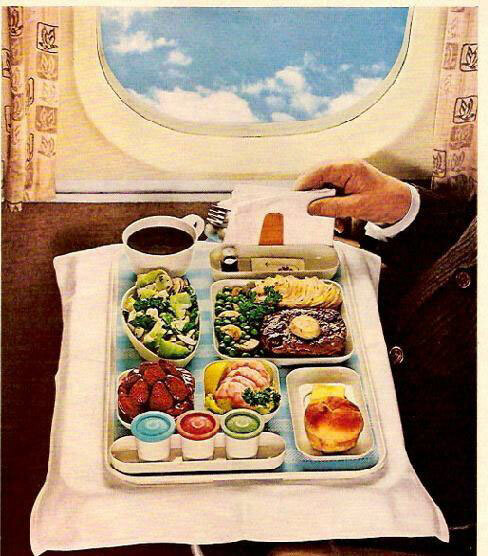 I have had my share of missed approaches; a few emergency landings being greeted by airport fire/rescue trucks; cancelled flights; missed connections; and trays full of both good meals and absolutely terrible meals served on board. 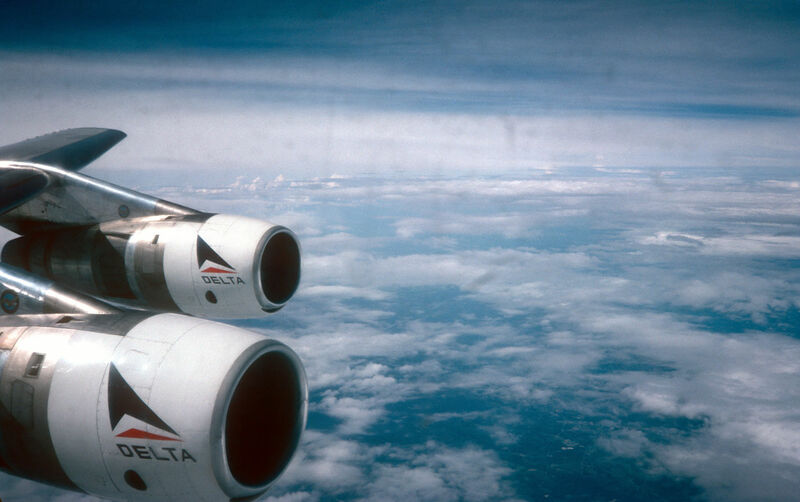 Shea Oakley asked me to write two articles, for Captain’s Log, and I thought the most appropriate thing I could do, considering the title of these articles, is to relate some experiences I had traveling those miles over 50+ years. I do not represent them to be significant (or even typical) but they are all memories that bring me back to a pleasant past. Air travel has certainly changed in these years. Probably the most notable thing that everyone experiences is that in the 1980’s and 1990’s the load factors were typically in the 70%-75% range. Not as good for the airlines as today’s almost fully booked airplanes, but more pleasant for the passengers—you often had an empty seat next to you. As a business traveler, I used to book a late flight returning home, knowing that if I was done early with my meeting, I could go to the airport and stand by for an earlier flight (at no additional cost), and usually get on the aircraft, and get a window seat. When American Airlines first introduced its frequent flyer program, they promoted that, as a frequent flyer, if you booked a window or aisle, they would put a hold on the center seat, and only use it if needed. The seating chart on the screen showed an asterisk in that seat indicating it was not occupied but only assigned if needed. I was also a proponent of airline clubs. I lucked out early on with a membership in the Eastern Ionosphere club. I signed up for a $25 one-year membership. A few months later I was offered a 5-year membership for an additional $100 (which I took), and a few months later, I was offered and took a lifetime membership for an additional $250. Best investment I ever made because it then evolved into a lifetime membership in Continental’s President’s Club and now I am a lifetime member of the United Club. And this all started when I was a teacher and only flew once or twice a year to visit relatives in Orlando, Florida. When I left teaching and went to the corporate world, that membership became vastly more valuable. I also paid yearly fees to join Delta’s Sky Club, and before the merger I was a paid United Red Carpet Club member. Yes, the quiet surroundings and lounge chairs, and the often-free liquor were benefits, but the main reason—whenever you had a problem, the airline club helped. If a flight was cancelled or you needed to change a flight, you go into the club and there is no (or a short) line. 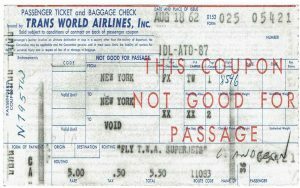 And if you travel often, and they recognize you (and they did) you might even be treated into an upgrade (this was before the days when the computer automatically assigned them). 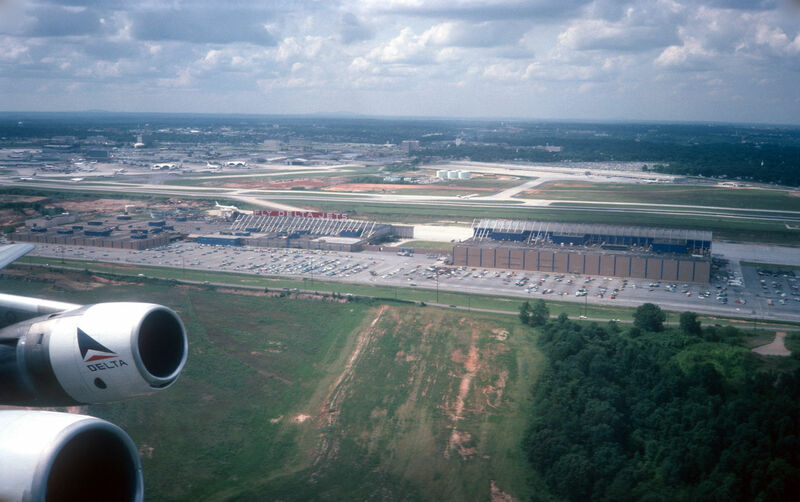 I was once on a Friday afternoon flight from Atlanta to Newark. Forecast was for snow to start in the late afternoon in the NY area. My 2:00 pulled back from the gate, and maybe we got 20 feet, when the aircraft stopped, and the pilot came on the intercom to give us the bad news that Newark closed due to snow. We all went back out to be reticketed. I was about 4th in line and they were trying to get people to the northeast. Hartford was open but was anticipated to close very soon. Same thing for Boston. I got to the front of the line and said “book me to Orlando” ( I have relatives there). They told me that was the opposite direction. I said, “but it’s not snowing there” and I got a round of applause from the rest of the line. And in those days interline ticketing was normal. Delta booked me on an Eastern L-1011 to Orlando on a flight leaving within the hour and an “open ticket” back to Newark when things cleared up (Sunday). Today, I am afraid I might be waiting in Atlanta for a few days just to find a flight with an open seat. I love to fly, and I am not ashamed to tell anyone that. But not everyone is, and sometimes my seatmate was not happy being on an airplane. 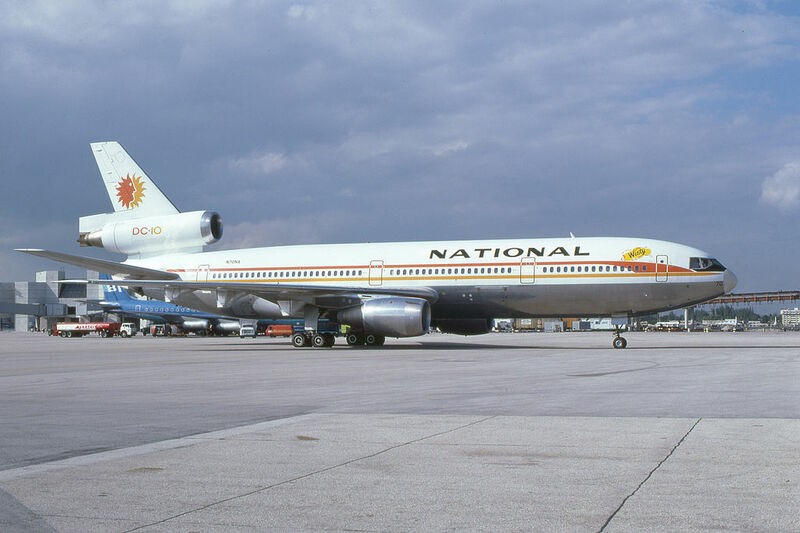 In the late 1970’s I was on a National DC-10 coming home from Florida. The DC-10 was a great airplane, and like all widebody planes it was “different” from the single aisle airplanes in that the cabin was divided into smaller sections. Reading up on everything I could find about airplanes, I learned that the cabin dividing walls were attached to the floor and would “float” on the ceiling so that as the aircraft cabin twisted (a normal situation in aircraft design) you might see the top of the walls move independently of the ceiling. This flight was a very bumpy one. I would not call it severe turbulence, but enough that all meal service and walking around the cabin was stopped. The woman next to me (maybe my mother’s age) was afraid of flying. As we were bouncing around, she was upset, and I was talking to her explaining that is was nothing to be afraid of, that airplanes were built for this, that the captain was on the radio to see what altitudes had less turbulence, and that as soon as the captain could find smoother air I was sure he would get us a better ride. 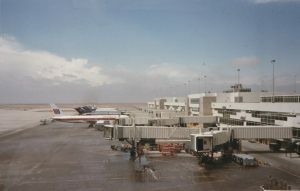 While I am talking to her calmly and trying to minimize her fear, I am watching the airplane twist and seeing the wall cabin barriers move what looked like 6 inches each way from their parked location on the ceiling. That excited me that I was actually seeing this, but I could obviously not say anything or even make reference to my excitement in seeing this engineering marvel as I was trying to calm down my seatmate. 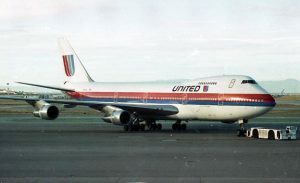 In the late 1980’s I was on a United 747, upper cabin (my favorite place to be on a flight). I was traveling on business and sat next to someone a dozen years younger than I was. He was deathly afraid of flying. He had just started a job with one of the big-eight accounting firms as a consultant, would be traveling a great deal, and was very concerned. I took most of the rest of the flight trying to first explain the wonders of air travel and why he should not be afraid, and then explaining some tips I know from co-workers who didn’t like flying as to how to minimize their fear. On a 747 walking around is easy (especially in First) so a couple of times I told him that we should walk down to the lower deck First cabin to “stretch our legs”. He was concerned about long taxi times, and I gave him the simple trick of booking an early flight out. We went over the usual things they tell you (drink lots of water, little coffee, and almost no liquor) and to stay in shape for business meetings when you land. It was a coast to coast flight, so we spoke on and off for over 4 hours. At the end of the flight he thanked me and said he felt much more equipped to perform the duties of his new job—at least the part about flying to the client’s location. I was on a US Air flight (I think from Charlotte) and we were on the airplane because of a weather delay in Newark. It was a few hours and because we could be given clearance to take off at any time, passengers could remain on the aircraft or go out to the gate are but were asked to stay close by. There was a passenger seated next to me who kept complaining about US Air and the delay. I finally suggested that if US Air could control the weather, they could make a lot more money doing that instead of sending people around the country in aluminum tubes. (By the way, he later got off and either found another flight or decided not to go, because he did not come back). Later the pilot came back to chat. Since it was a few hours delay (and I know about crew schedule times), I asked the odds of our taking off tonight. He said that the crew had plenty of time and that was not a concern. He was honest in saying that US Air would certainly like to get us to Newark as ticketed, but they were probably even more interested in getting the aircraft there for the early morning flights. I travel much less now, and being retired, never for business. Add to that the hub/spoke system of airline scheduling and connecting no longer has to be “the only way” to get there. But in those days, when flights were delayed, one of the things I felt good about, both from the airline personnel who announced it, and from fellow passengers who allowed it, was the announcement that a number of travelers had close connections and if you were not in that situation, please let them exit first to make those connections. Both on the flights where I needed to rush out to connect and on flights where I waited because I was not in a rush I saw probably the best example of human teamwork and kindness to other fellow travelers anyone could experience. Traveling on business I did my share of international travel. I went to the places many people go, Paris (truly the most beautiful city), London (a lot smaller than you think or expect), Melbourne Australia (a place that prides itself on being the most like the US—and if only it were closer I would go back) and of course Canada (which was easy because passport control and customs were on the Canada airport side, so on return you just got off the airplane). Children are the same all over the world. They will play and climb over monuments or memorial cannons in parks. Young men are, too. I saw many soldiers in uniforms at the end of the day carrying one rose or a small bunch of roses to their wives or girlfriends. Fresh fruit and tomatoes (technically a fruit but you know what I mean) at every meal—even in November. And in my limited experience no one in Moscow knew how to make a good cup of coffee (but the tea was plentiful and good). There are no “lines” at the airport. It is a mad dash of pushing. It took me 2 ½ hours to get into the gate area and be able to board the return flight with just 20 minutes to spare. Because you don’t drink the tap water (or even brush teeth with it), everyone uses bottled water in Moscow, but even that safer water tasted salty. 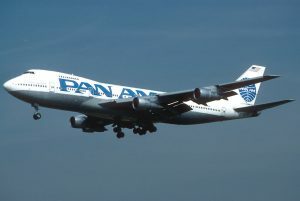 I think Pan Am gave everyone large tumblers of water when they sat down and asked for a drink from the flight attendants. If you have enjoyed my ramblings, this article will continue in the near future. There will be more random experiences I remember fondly, and one of the ways I got to learn some fascinating facts about different airplanes. The 20-year period between the end of World War I and the beginning of World War II has been called the “Golden Age of Aviation.” During this time, airplanes morphed from slow, wood and fabric-covered biplanes to fast, stream-lined, all-metal monoplanes. Civilian aviation grew, and many dramatic aerial feats took place. Barnstormers and wing walkers captivated the public with daring feats that often cost many their lives. There were great expectations that dirigibles would encourage transatlantic passenger service. 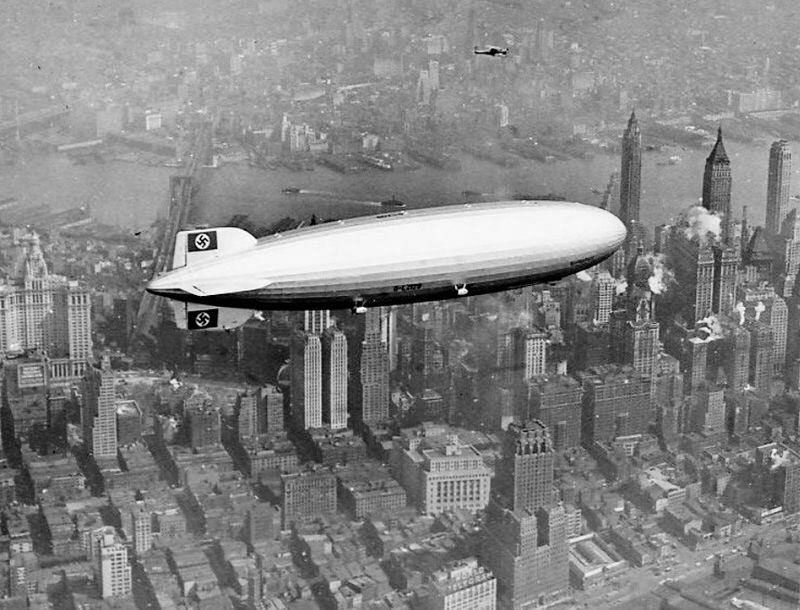 The Empire State Building, completed in 1931, had a dirigible mast for the ships to dock. 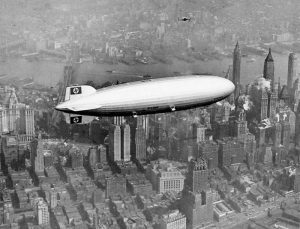 And dirigibles did encourage passenger service until the Hindenburg disaster in 1937 killed 36 passengers, and the dirigible business. 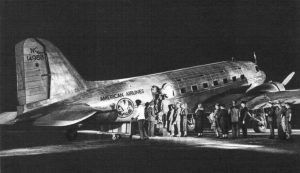 It was during this period of aviation growth, that the “plane that changed the world,” the Douglas DC-3 appeared on the scene. In 1934, the year before the introduction of the DC-3, a flight from New York City to Los Angeles was a grueling ordeal, typically requiring at least 25 hours, at least two changes of airplanes, and as many as 15 stops. 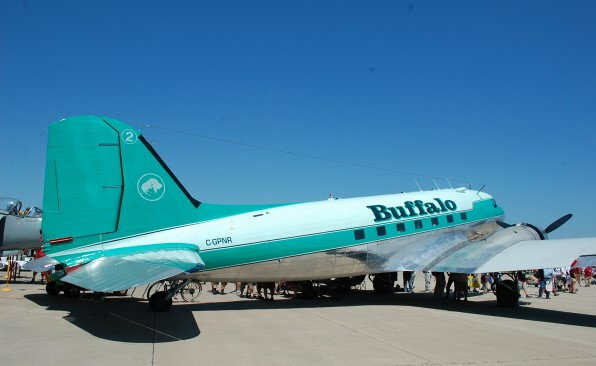 Now, a single plane, the DC-3, could cross the country, usually stopping only three times to refuel and pick up passengers and mail. The year was 1939. It was a cold January afternoon at New Jersey’s Newark Airport. A gleaming polished aluminum American Airlines DST (Douglas Sleeper Transport) sat ready for departure, bound for Los Angeles’ Glendale Airport, in California. Newark was the only major airline terminal for the entire New York metropolitan area. Ground had been broken for another airport at North Beach, in Queens, New York, and it was due to open in October as LaGuardia Airport. The 1939 World’s Fair would soon open, in Flushing, Queens, and we were expecting a major influx of tourist to the metropolitan area. LaGuardia would make it convenient for tourist to see the Fair, landing them about three miles from the center of the Fair. The sky was cold and clear, but there were war clouds on the horizon. Hitler had reoccupied the Rhineland in defiance of the Locarno Pact, and there had been open intimidation between England and Germany. We knew it would not be long before we were involved in another war. For Americans, life was getting better. We felt a gradual easing of the Depression, as more of us were working, albeit in defense related industries. Rib roasts were selling for 31 cents a pound, and The New York Times was still two cents if I remember correctly. The rich and famous, and business men could avoid an exhausting one-week coast-to-coast rail trip by booking passage on one of American Airlines’ new DSTs, the first model in the rapidly-becoming-famous DC-3 series. 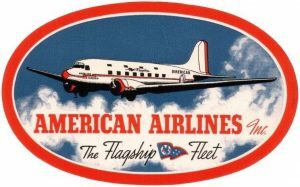 The DC-3 was introduced into American Airlines service about six months after the Douglas company rolled it out on December 17, 1935. It was the first airplane that could make money flying people and not depend on the mail subsidy. 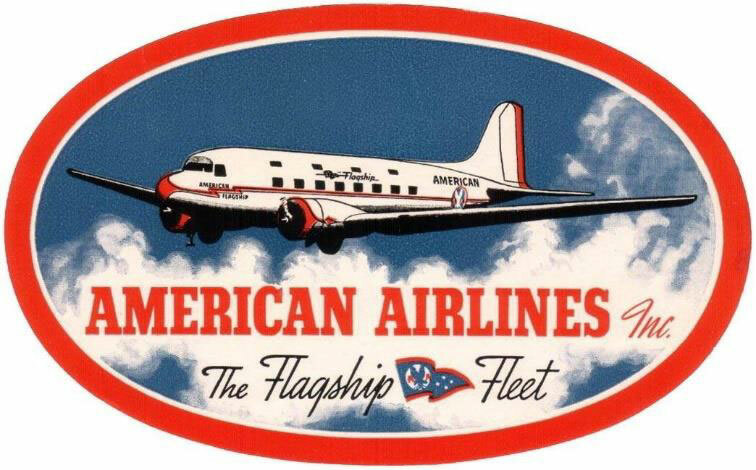 I was on board American Airlines “Mercury Service” Flight 401, Flagship Texas. This flight is part of American Airlines “Flagship Fleet,” named because each new DC-3 proudly carried the name of one of the 48 states in the union. Upon landing, the copilot would “strike the colors,” as the aircraft taxied into the terminal. The flag, bearing the eagle insignia of American Airlines would always snap sharply in the wind above the copilot’s window. The same trip by rail took several days, so if you were in a hurry to conduct business, the plane made more sense. Coming east, however seem much longer when we had to push our watches ahead three hours. 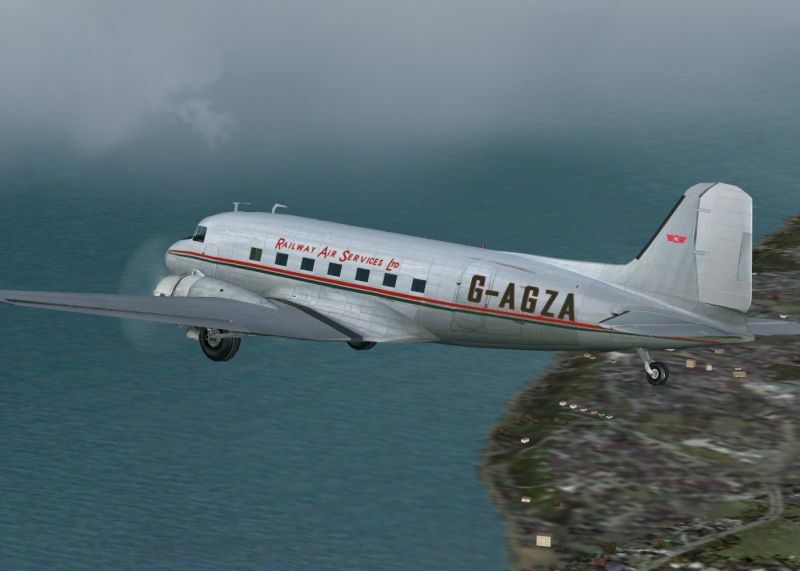 The DC-3 was fast for its day. Its cruise speed was 207mph (333km/h) It had super-charged 1,200-horsepower twin engines, cantilevered metal wings, retractable landing gear and steam heat. The flight was fully booked with 14 passengers, me being one of them. The DST was the height of luxury. Fourteen plush seats in four main compartments could be folded in pairs to form seven berths, while seven more folded down from the cabin ceiling. 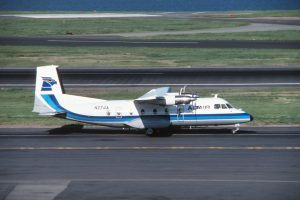 The plane could accommodate fourteen overnight passengers or up to twenty-one for shorter daytime flights. By rearranging the seating the airlines were later able to increase the capacity to 28 people. The passenger door was at the rear of the airplane and once aboard each of us had to walk up the aisle. Since the airplane had a tail wheel, we had to walk up an incline of about 30-degrees. I watched from my seat as the captain did his inspection of the tires and movable wing surfaces. Later, when I asked him, he said he was inspecting tires for wear, and the flaps and ailerons for smoothness of motion. When the captain came back on board, the stewardess as they were called in those days, closed the door and checked to make sure everyone was buckled up. In those days as part of their job, they were required to be registered nurses. Suddenly, the propeller on the right side of the airplane started to turn a few revolutions before it went through belching thick white smoke and was spinning at such a rate that one could not count the blades. 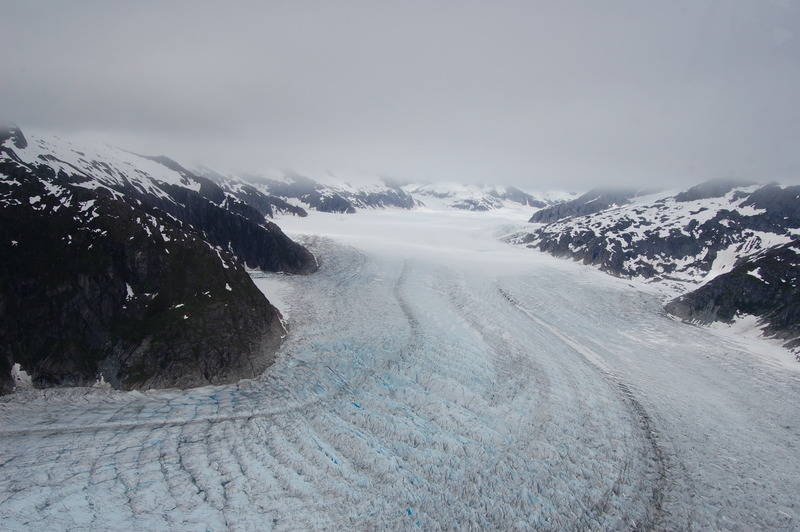 A minute later the propeller on my side started that slow lethargic few turns before it belched thick white smoke and was whirling at a dizzying rate. 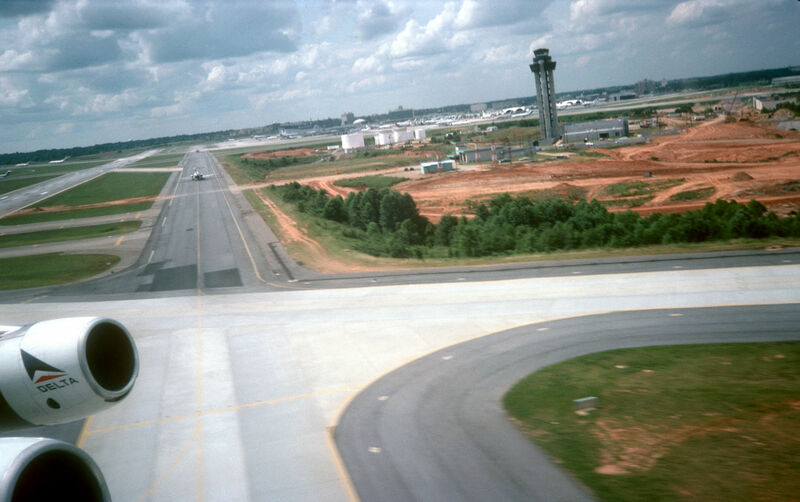 Then we began a slow, bumpy ride down the taxiway, turned and came to a stop. The stewardess made a quick walk up the aisle checking that all were still buckled in. She took her seat and spoke something into the telephone hand set she was holding. Suddenly the roar of the engines became very pronounced. The plane began to vibrate and the noise level increased. 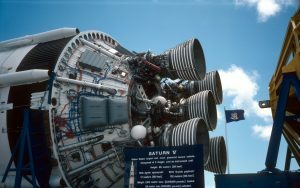 One could feel the inherent power of the engines. It was like a race horse straining at the gate to be freed to run the race. About thirty- seconds later the plane suddenly lurched and began to roll forward, picking up speed. About halfway down the runway, the back of the airplane lifted and was level. The airplane left the ground so smoothly that none of us in the cabin realized what had happened until we saw the lights from the field rushing away behind us and the city lights below winking through the darkness ahead of us. One hour after takeoff, the DST was drumming south westward in a valiant but futile attempt to catch the setting sun. Ten thousand feet below us the land was wrapped in the covers of darkness with only the electric fires of civilization rolling beneath us sustaining the reality of motion. Once airborne, we were served cocktails, but then it was complements of the captain, who said so over the public address system. That was followed by dinner choices of sirloin steak, Long Island duckling, or lamb chops, served on Syracuse China with Reed & Barton silverware and real linen napkins. It was like eating in a high-class restaurant. During the meal service the captain would send back his written flying report to be passed among his guests, as he called us. Most of us did not understand the technical details of the report but we sure appreciated being informed of our progress and what was ahead of us. In those days flying was still mysterious and for some scary. We had polished off dinner by the time we over-flew Norfolk, Virginia, and were enjoying desert of ice cream and coffee, and the Sun had yielded to an evening sky of deep purple. The captain announced that we would be stopping to refuel and pick up the mail in Nashville, Tennessee. When we landed the captain made the landing, in the new style rather than the three-pointer which may frighten some of his passengers. Another crew would take the Flagship Texas, and its sleeping cargo on to Dallas, the next stop. The DC-3’s primary—and romantic—accomplishment, is that it captured America’s imagination. The journey became the destination. And with good reason: Passengers aboard the plane entered a protected world unbelievable to today’s stressed air traveler. The DC-3 married reliability with performance and comfort as no other airplane before, revolutionizing air travel and finally making airlines profitable. It was a fifteen-hour and 40-minute flight, but when you subtracted the three hours’ time difference it wasn’t a bad trip in those days. 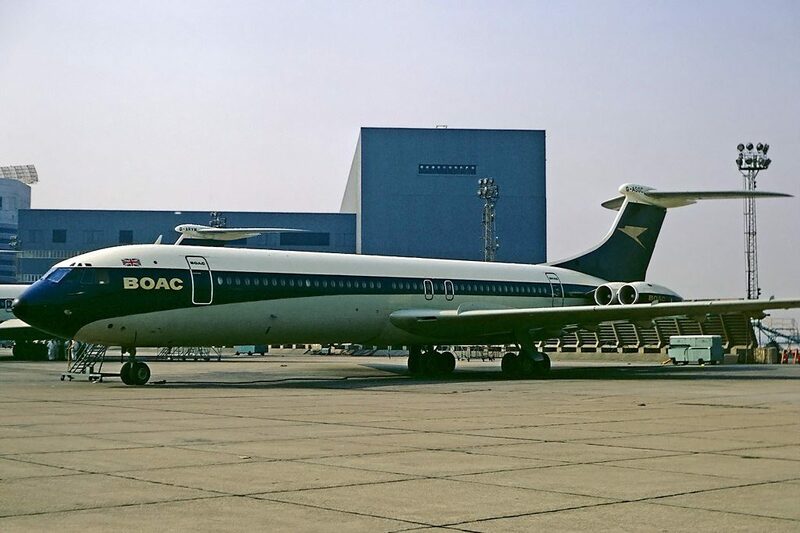 Many of us thought that this air liner would revolutionize airplane travel and go down in aviation history as one of the finest air liners ever built. 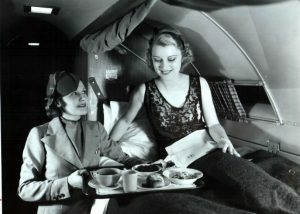 For the two movie stars on this flight who had paid an additional $160 over the standard round-trip fare of $264, (equivalent to about $3,800 today) they had the privilege of occupying a private compartment known as the “Sky room,” or “Honeymoon Hut,” where they are regularly comforted by the enthusiastic attentions of the stewardess. The captain came out of his office as he called it and walked the comfortably wide aisle of the passenger cabin, pleased to answer any questions his guests might have. I like the idea of being called a guest. I asked him how he can find his way in the dark. He explained that there were several ways to keep from getting lost. One was the radio direction finder, a radio beacon system that sent out pre-recorded Morse Code signal that told him where he was on course. Then there were the beacon towers left over from the airmail days that pulsed a light. In the daylight some of the towns and cities had painted the name of the city on the roofs of some buildings, also a left-over from the airmail days. 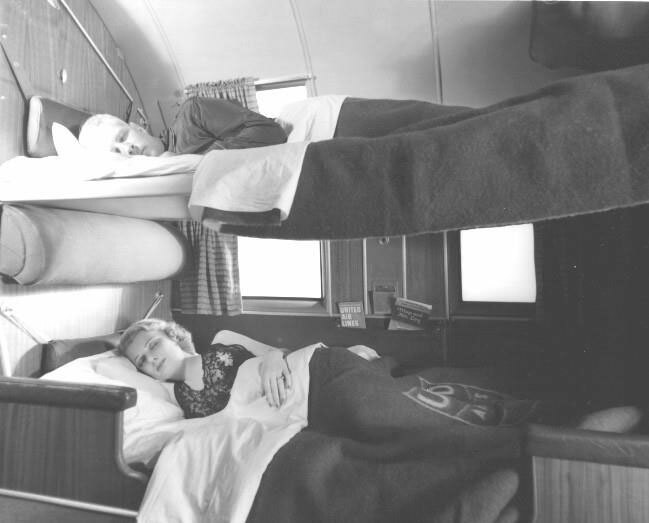 Later we would all retire to very comfortable berths, designed to the standards of the Pullman sleepers on the railroads. The captain would later walk the same now darkened aisle making sure everything was buttoned down properly. By then we were all asleep, wrapped in warm cocoons of goose-down comforters nestled snugly on feather mattresses, behind individually curtained upper and lower sleeper berths. 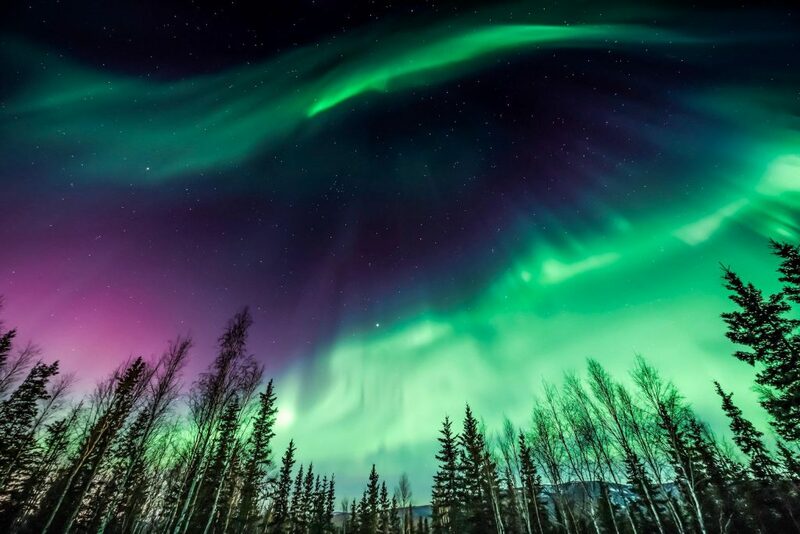 This night it was clear, and the two pilots had easily followed the long winking airway lights westward. We bumped along a bit after departing Dallas, in the wake of a passing thunder storm, but most passengers weren’t bothered by the mild turbulence. Oh, I have been on flights where everyone was so sick, we thought we’d die, but this was not one of them. Once airborne out of Phoenix, the stewardess would waken those still asleep and for each of us, serve a hot breakfast. This trip it was fresh coffee, juice and a choice of wild rice pancakes with blueberry syrup or a Julienne of Ham Omelet. She would then tidy up the cabin for our on-time arrival in Glendale Airport. When we deplaned, we would be refreshed after a long night’s sleep and ready for a new day, more than can be said for today’s jet-lagged and cranky passengers who endure a flight over the same geography. Today, when we fly commercially we think of aircraft in terms of a name and number, for example, Boeing 747, or Airbus A380. Nowhere in an airport or on the airplanes will we see the name, Ford. Over 90 years ago a man had a vision. 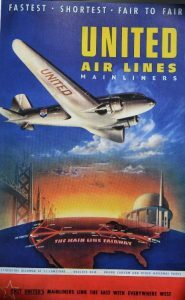 He foresaw the day when people would be transported on a commercial airline network spanning the United States, and the world in a safe, comfortable, and reliable way. His name was Henry Ford. Ford took the airplane, considered by most people at the time to be a noisy and dangerous machine, and transformed it into a successful commercial product. His product was radically different. 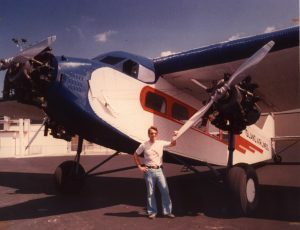 His all-metal airplane design called the Ford Tri-Motor, affectionately called the “Tin Goose,” would lay a golden egg. 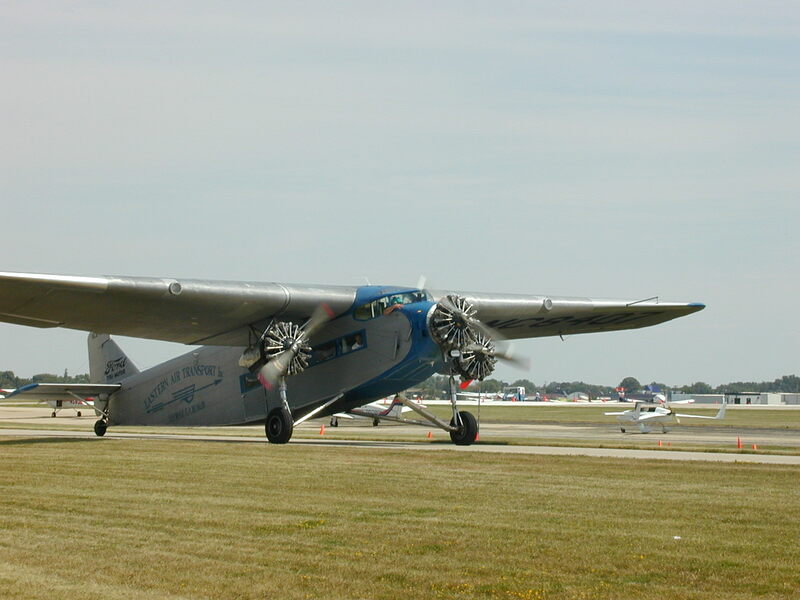 The Ford Tri-Motor was the seed that spawned commercial aviation in the United States. 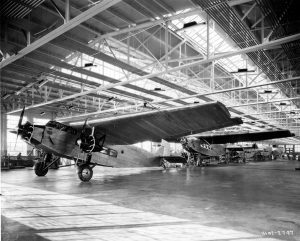 The story of the Ford Tri-Motor begins with William Bushnell Stout, who during World War I, worked for the Packard Motor Car Company, as the chief engineer of their aircraft division. As the war ended, Stout designed an airplane for army called the “Batwing.” It was the first American-built internally-braced cantilever-wing monoplane. 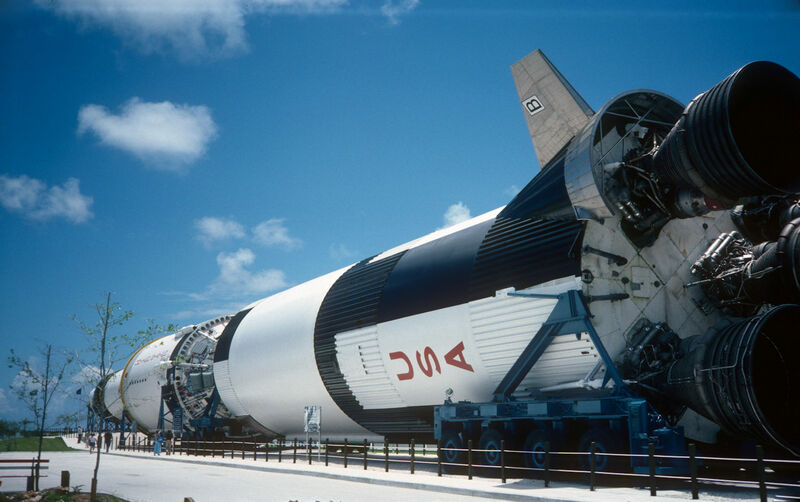 It also had the first plywood veneer used as an airplane skin in the United States. By the time it flew, the war had ended, and the army had lost interest. The Batwing drew the attention of the navy who commissioned Stout to build an all-metal twin-engine torpedo bomber. It crashed during a test flight, and never went into production. After this failure, Stout turned to the commercial market for financing of a new design. He sent letters to 100 Detroit industrialists, including Henry Ford, asking for $1,000 from each. He received about 65 responses. Stout raised $20,000, including $1,000 each from Edsel and Henry Ford. Now with enough funds, Stout incorporated the Stout Metal Airplane Company on November 6, 1922, “to develop and manufacture aircraft.” Stout’s first design was a four-passenger monoplane made of metal and powered by an OX-5 engine. He called it the Air Sedan (AS-1). 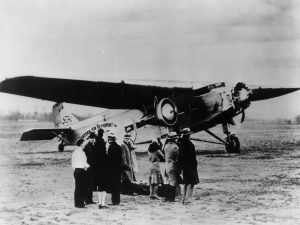 The Air Sedan first flew on February 17, 1923, and its performance was poor. On the test flight it was obvious the plane lacked power. Stout “found” a Hispano Suizza engine, and with this new engine, the plane flew satisfactorily. 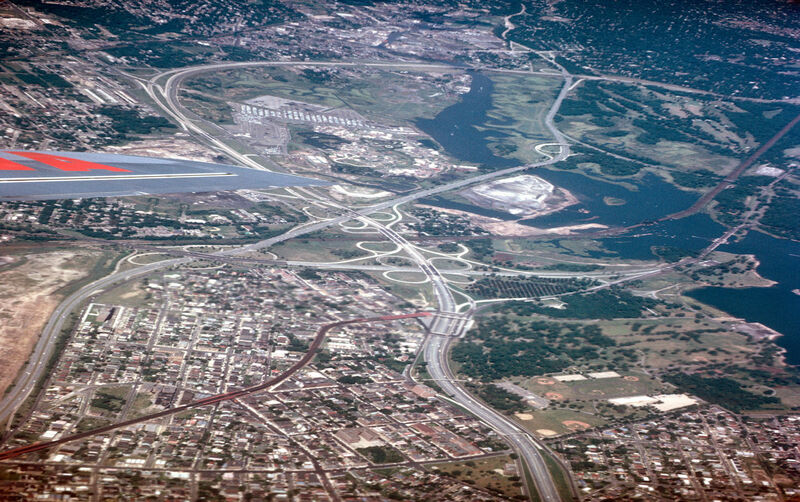 When Ford heard of Stout’s experiments he began to consider the possibilities for commercial aviation. 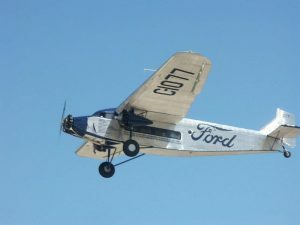 In a conversation Stout had with Henry Ford, Stout told Ford that he wanted to build something more powerful than the Air Sedan, one that could carry 10 people (two crew and eight passengers) or the equivalent in cargo, have a high wing and use of 420 hp. Liberty engine. Stout’s next design was the 2-AT “Air Pullman,” which first flew on April 23, 1924. It was a single engine high wing monoplane built entirely of corrugated duralumin. Stout’s idea to build an airplane completely out of metal was radical. 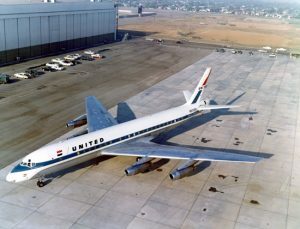 The U.S. Airplanes were being built of fabric stretched over wood or metal frames. 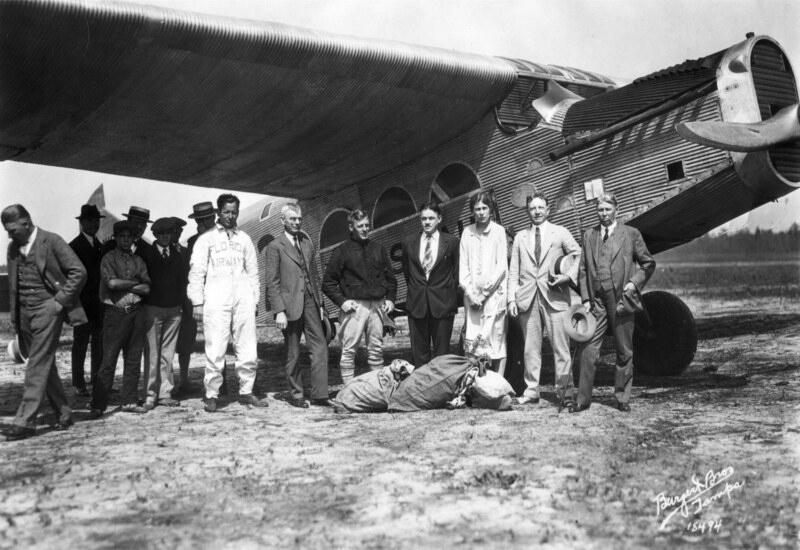 Stout had named his airplane “Maiden Detroit” to promote civic interest in his venture. 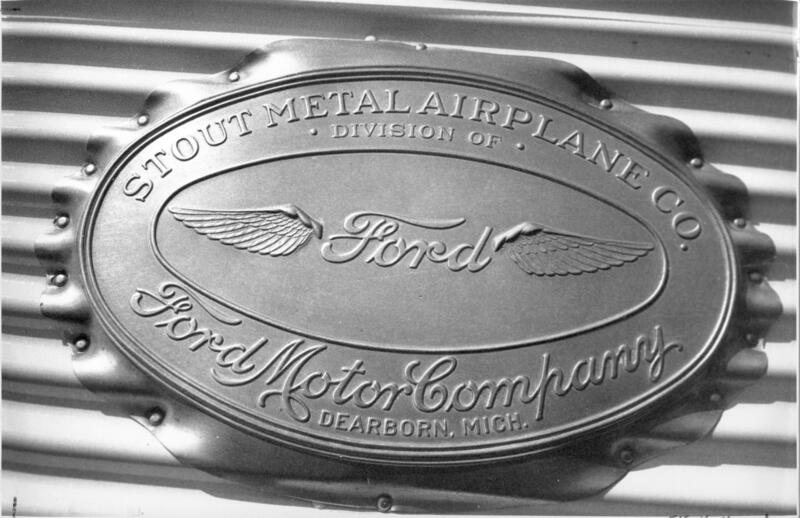 When it was used for freight it was called the “Air Truck” and was the first Stout plane to have the Ford emblem on its fuselage. In December 1924, the U.S. Post Office bought “Maiden Detroit” to carry airmail. This gave Stout’s company the financial boost it needed. By March 1925, his “Maiden Dearborn,” was ready for tests. On April 13, 1925, “Maiden Dearborn” left Detroit for Chicago. It was the first flight of the Ford Air Transport Service, inaugurated by Ford to carry auto parts, company mail, and executives to his Chicago plant. Soon 2-AT “Maiden Dearborn II” was placed in service on this line. 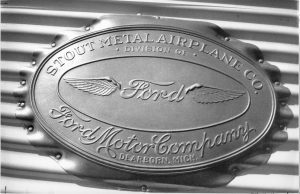 On July 31, 1925, Ford bought Stout’s company, and it became the Stout Metal Airplane Division of the Ford Motor Co. By December 1925, Stout had manufactured 11 single-engine 2-ATs, and five were used by the Ford Air Transport Service. Ford tried to convince the public that flying in a Ford plane was the right thing to do. In August 1925, he established the Ford Air Reliability Tours, covering thirteen cities and 1,900 miles. The event was open to all aircraft manufacturers and it attracted Europe’s best-known aviation figure, Dutch-born, Anthony Fokker. For the race, Fokker converted his newest transport, a single engine F.VII, to a tri-motor. There is speculation that a glimpse at the plans for Ford’s Tri-Motor prompted him to do this. The modified Fokker dominated the race coming in first, followed three minutes later by the Ford entry, a single engine “Air Sedan.” Both Ford and Fokker profited enormously from the publicity. The publicity Fokker received was enough to launch his airplanes on a successful career in America. Not completely satisfied with the 2-AT, Ford directed Stout to build a larger airplane with three engines. 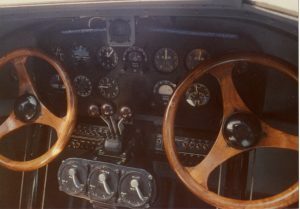 Stout took the basic layout of the 2-AT and mounted a Wright Whirlwind air-cooled radial engine under each wing, and a third in the nose. The nose was rounded with windows to give forward vision for the passengers. 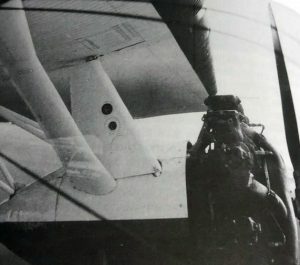 The pilot’s open cockpit was placed above the cabin, and wing which gave the pilot poor landing visibility. The 3-AT presented a hideous appearance and was labeled a “monstrosity,” by observers. The test pilot, R. W. “Shorty” Schroeder, almost crashed it on landing. His report to Ford and that of another test pilot convinced Ford he had a “lemon.” Ford was angry, and his friendship with Stout dissolved. A mysterious factory fire the night of January 17, 1926, destroyed the 3-AT and Stout’s earlier designs. Stout was sent on a speaking tour to promote aviation, and a new group was formed to design a new tri-motor. For years, Stout was credited with having designed the Ford Tri-Motor, although he never made that claim himself. The original 4-AT design was the result of the ideas of several men, and none claimed exclusive credit for it. Tom Towle, an assistant to Stout figured prominently in the design. Towle was directed to lay out the design and others were brought in to assist him. 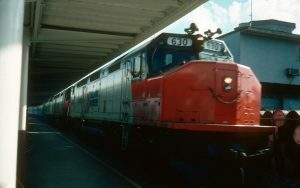 Towle took the general layout of the 2-AT as the basis for the 4-AT design. The 4-AT was a vast improvement over the 3-AT. 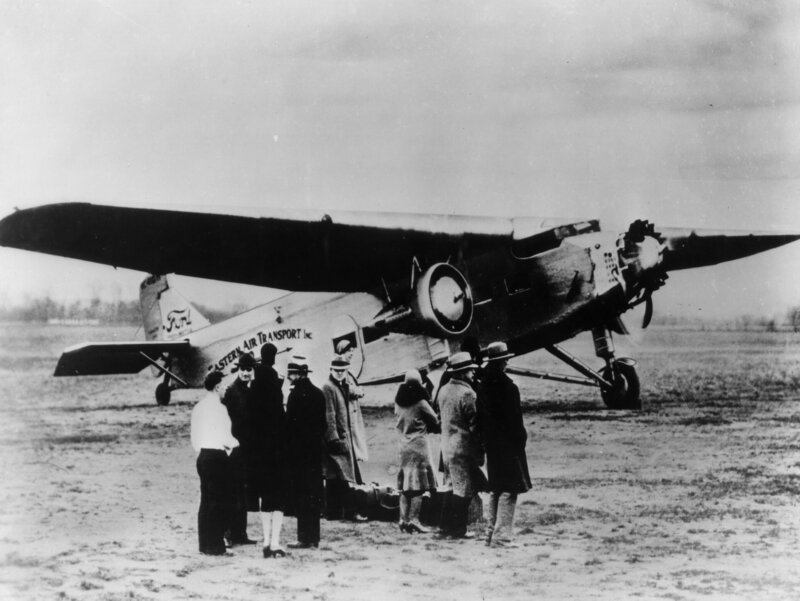 On June 11, 1926, it made its first flight. 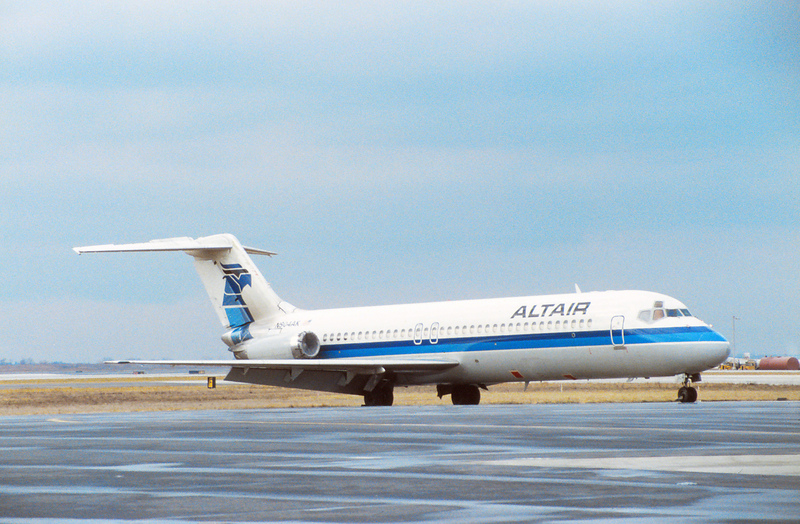 The test pilot reported that the plane’s performance was perfect. 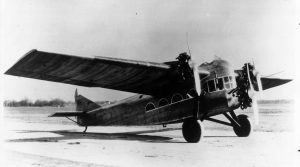 Although designed primarily for passenger use, the Tri-Motor could be adapted for hauling cargo, since its seats could be removed. The Ford Tri-motor resembled the Fokker F.VII tri-motor, but unlike the Fokker, the Ford was all-metal, allowing Ford to claim it was “the safest airliner around.” Its fuselage and wings followed a design pioneered by Hugo Junkers during World War I and used post war in a series of airliners some of which were exported to the U.S. 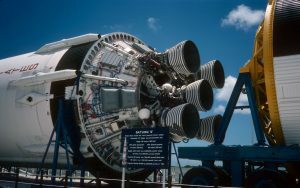 Constructed of aluminum alloy, which was corrugated for added stiffness, the corrugations resulted in drag, and reduced its overall performance. So similar were the designs that Junkers sued, and won when Ford tried to export an aircraft to Europe. In 1930, Ford counter sued and lost a second time, with the court finding that Ford had infringed upon Junkers’ patents. Although the Ford and Fokker airplanes dominated the commercial aviation network of the late 1920s, they had serious deficiencies, and lacked the basic creature comforts. 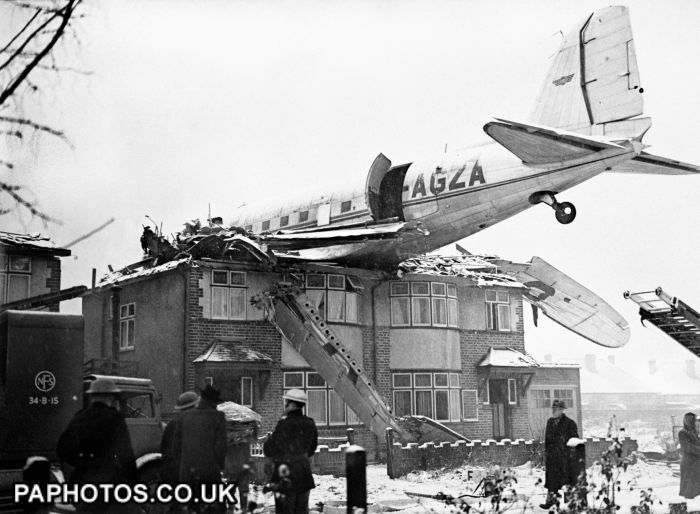 The airplane would still have to demonstrate that it was relatively safe, reliable and comfortable. This would not be easy for the Fords and Fokkers. There were accidents where the wings separated from the wooden planes in flight. If a Ford had an engine failure on take-off, the resulting vibrations, and the poor airflow over the corrugated skin, would sometimes cause the plane to stall. Engineers had their work cut out for them if they were to solve the technical problems that plagued the early aircraft. This was at best a benign overstatement and in no way resembled reality. While the advertisement spoke of comfort and safety, the cabin was not heated and the sound level inside a Ford was 117 decibels, which could permanently damage a person’s hearing. Copilots handed out packs of chewing gum, cotton, and ampoules of ammonia. 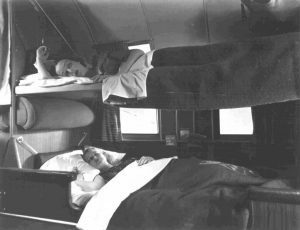 The gum was to equalize the pressure on the passenger’s ears, the cotton blocked out some of the noise, and the ammonia was to relieve air sickness. 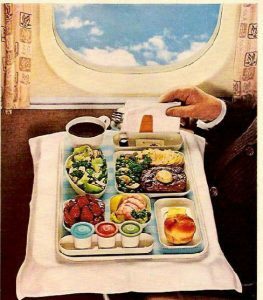 Air sickness was so common on the southwestern flights of Transcontinental Air Transport that someone suggested putting pictures of the Grand Canyon on the bottom of the air sick cups, so no one would miss the view. 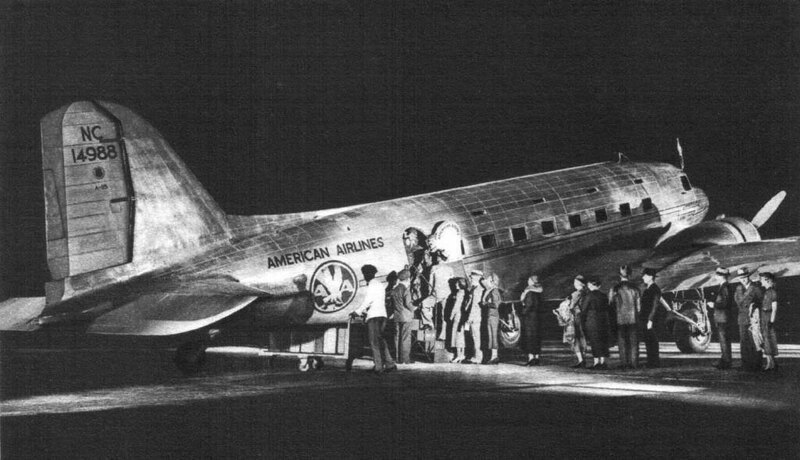 When passengers arrived at their destination, they got off the Tri-Motor physically and psychologically exhausted. Their bones ached, their nervous systems were a jumble of skinny wires all sounding different notes, and their heads pounded from the constant propeller noise. One hundred ninety-nine 4-AT and 5-AT Ford Tri-Motors were built. The army, navy and Marines each used the Ford. 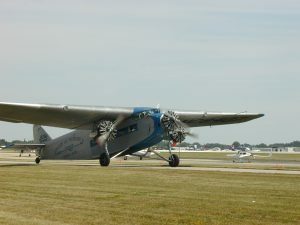 The deepening economic depression, and the appearance of new and faster types forced the Ford Tri-Motor out to grass. The Ford would prompt William Boeing to come up with something better, the Boeing 247. 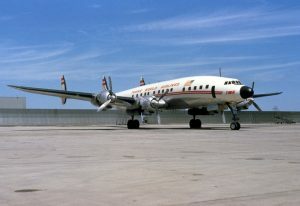 The skies in the 1950s were ruled by the radial piston engine airliners like the Douglas DC-7 and the Lockheed Super Constellation. 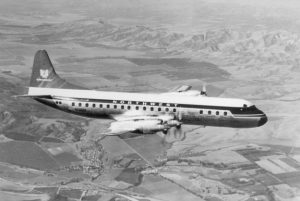 And although the long-range Boeing 707 and the Douglas DC-8 jets were in production and soon to be enter the market, some airlines felt the need existed for a large, medium range turboprop airliner. 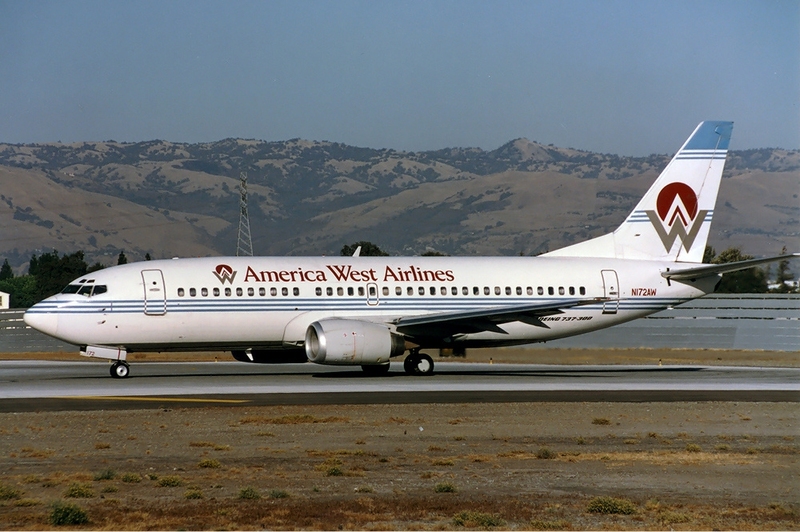 Lockheed began construction of this airliner in December 1955, with two firm orders on the books (one from American Airlines for 35 and the other from Eastern Airlines for 40) In all, 14 airlines U.S and international would order 170 Electras. On December 6, 1957, the prototype Lockheed Electra flew, two weeks ahead of the initial flight of the Boeing 707. The airplane was the second Electra. 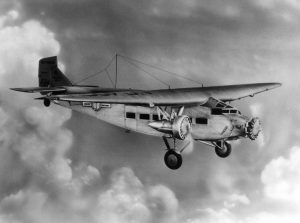 In the 1930s Lockheed had built an earlier aircraft named the Electra, a twin-engine aircraft that was over shadowed by the Douglas DC-3. Eastern Airlines flew the Electra, designated L-188A, on its first revenue flight on January 12, 1959, and American Airlines followed on January 23 of the same year. 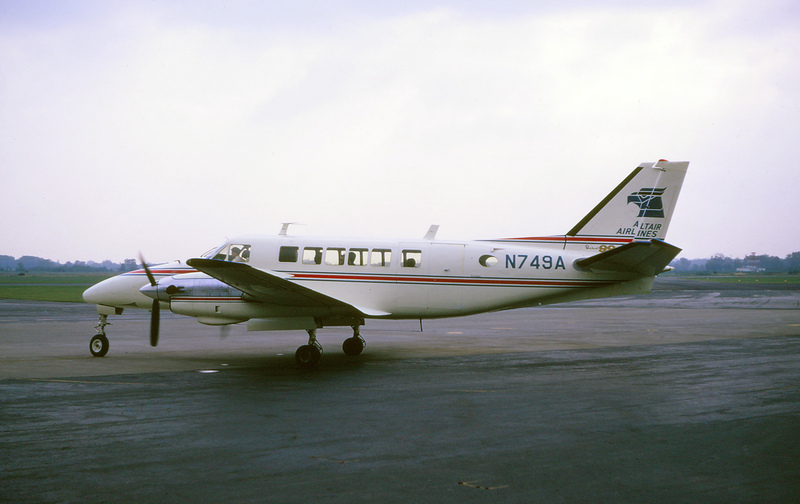 The L-188C, with increased fuel capacity offered greater range, and went into service later in 1959. Behind this new airplane were four years of research and more than $50 million in developmental courses. It had gone through 60,000 hours of wind tunnel tests, and everyone was sure it was the safest and best airplane ever manufactured. But nowhere in the 40,000 miles of blueprints and more than 7,000 mathematical calculations did a phenomenon called “whirl mode” appear. 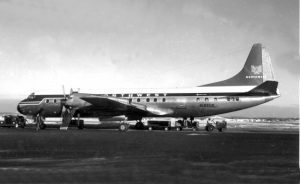 The Electra looked like a regular airliner, except for the thick, 13-foot propeller blades, and the four large engine nacelles housing the General Electric/Allison 501–314 turboprop engines. The large exhaust nozzles extended to the trailing edge of the wings and hid much of the wing area. 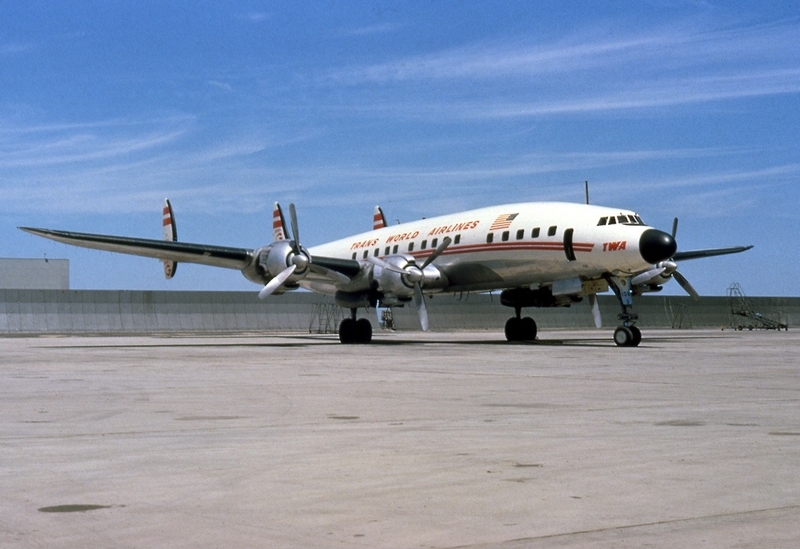 The Lockheed L-188 had excellent cockpit visibility, improved safety features and it was hailed by many as “a pilots airplane.“ Many airline officials considered the Electra a better all-around airplane then the Boeing 707. 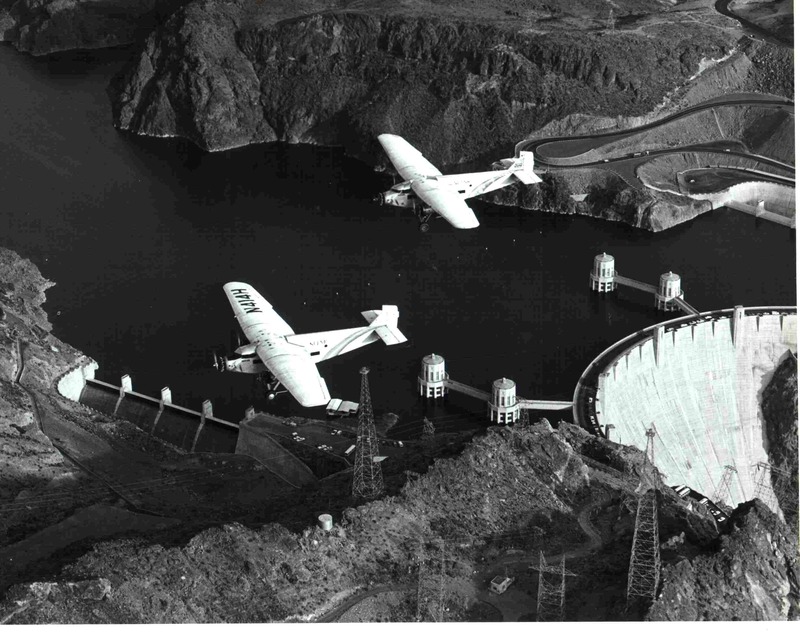 According to some, the Electra had more reserve power than any transport aircraft build to date. Its safety features were state-of-the-art. For example, there was a single control for an engine fire: One pull feathered the prop, shut off the fuel and oil supply, armed the chemical fire extinguisher and discharged the CO2 bottles all in one-second. 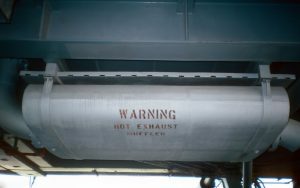 On older aircraft these four functions had taken up to 10 seconds. But the promising new airplane begin killing people. On February 5, 1959, an American Airlines Electra crashed into the East River while on final approach to New York’s LaGuardia Airport. Sixty-five people were killed. 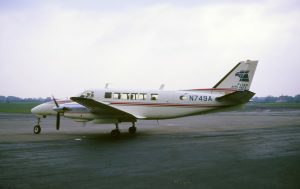 Although the crash was eventually attributed to a combination of pilot error, bad weather and an unfamiliar altimeter, the crash stained the Electra’s reputation. That stain would soon spread. It was September 29, 1959. Six crew members and 28 passengers, on Braniff Flight 542, from Houston to New York, were relaxing in the new Electra. It was a few minutes after 12 midnight, and a farmer in the rural town of Buffalo, Texas, had just shut off his TV. Suddenly, the sky outside his home turned an eerie yellow, and there was a continuous roar. The farmer and his wife ran out to the pasture, where they encountered small shards of aluminum raining down on them. His wife remarked it was raining. 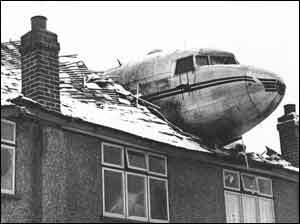 But it wasn’t raining; it was aircraft fuel. When the farmer shown a flashlight into a tree he could see a large chunk of metal. 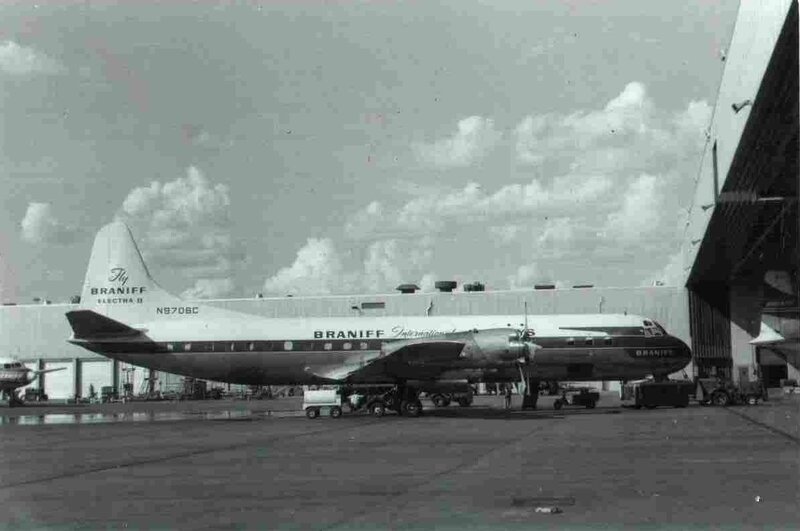 On it were the words “Fly Braniff.“ What caused this brand-new airplane to disintegrate over Buffalo, Texas? It was March 17, 1960, and the CAA was still piecing together the tragedy when Northwest Airlines flight 710, another Electra, bound from Minneapolis to Miami, made a routine scheduled stop at Chicago. The Electra took off bound for Miami with 56 passengers, 33 men, 23 women, one infant, and six crew. 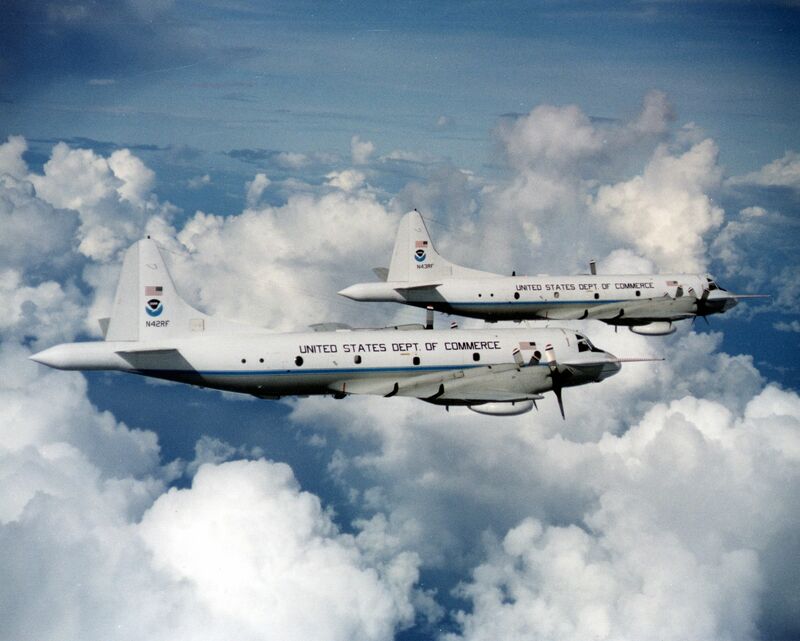 The Electra had settled into a normal flight, cruising above the cloud cover at 18,000 feet. At 1p.m. over Tell City, Indiana, something happened. Witnesses on the ground heard tearing sounds in the sky. Several saw the thick fuselage of the Electra emerging from the clouds. The entire right wing was missing, and only a stub of the left-wing remained attached to the fuselage. The airliner seemed to float for a while, according to some witnesses, defying the laws of gravity. But then it dipped, driving straight down, trailing white smoke and pieces of aircraft. It telescoped into a soybean field at an estimated 618 mph. The aircraft disintegrated on impact, creating a smoking hole that was 60 feet deep. There were no bodies. Rescuers found nothing at the impact site except scraps of metal that were not much larger than a spoon. But 11,000 feet away they found the left wing. This was, beyond alarming. In a period of less than six months, two brand new Electras lost their wings and disintegrated with much loss of life. 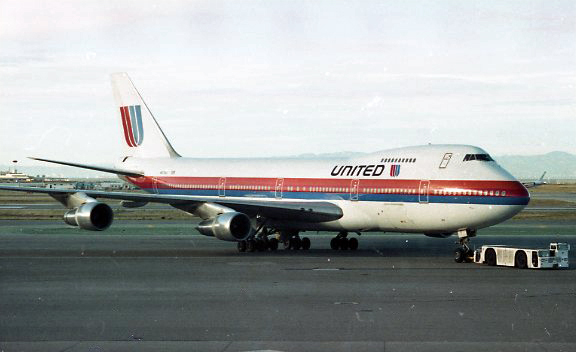 Could it have been severe clear-air turbulence (CAT) or was there something drastically wrong with these airliners? One week earlier the airframe, with only 1800 hours had undergone a major inspection. 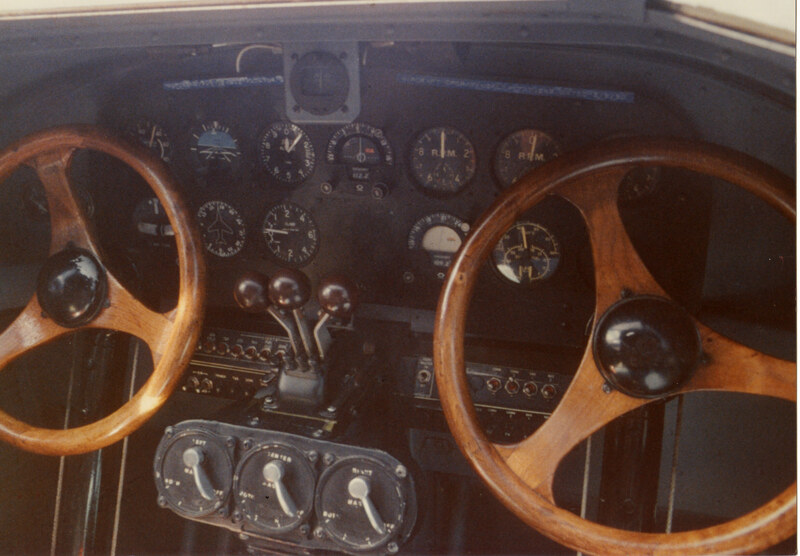 The captain, Edgar E. LaParle had 27,523 hours in his logbook. What had gone wrong? Meetings were held with the recently formed FAA, which was at the time headed by Elwood R. “Pete” Quesada, the legendary Air Force general, pilot, and aviation authority. The ensuing crisis was fueled by rumor and innuendo, and Quesada was on the hot seat. 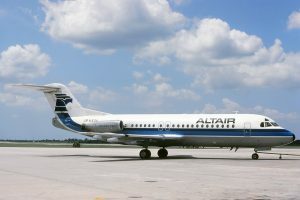 When he hesitated to ground the L-188 some said it was because of a former employee relationship he had with the manufacturer. Quesada’s actions and inactions would become as controversial as the L-188 itself. 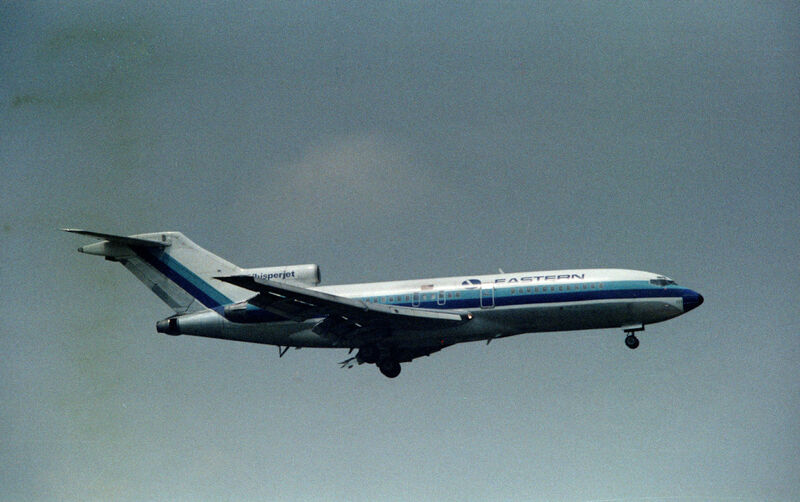 Pressure to ground the airplane mounted quickly, and the flying public avoided the 96 Electras already flying (only one European airline, KLM, initially operated the type). 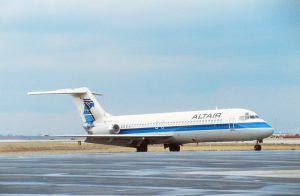 The airline experience up to a 35-percent dip in the loads on the aircraft, a catastrophic loss of revenue in an industry where a 10-percent decrease is damaging. But the Braniff Electra had not disintegrated, and the painful reconstruction had begun. And as they pieced together the wreckage, a clue emerged. It was something alarming. Shards of what appeared to be the left wing were found some distance from the rest of the wreckage. Could this tragedy have been caused by a severe clear air turbulence (CAT)? 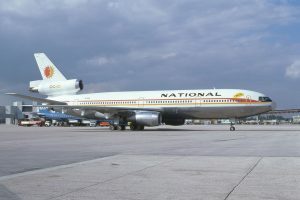 The public had lost faith in the Electras and the media was calling for the FAA to ground the airplane, and the sick jokes didn’t help. “I’d like a ticket on the Electra to New York!” The passenger reportedly said to the ticket agent. “We don’t sell Electra tickets; we sell chances,” the agent answered, according to the story. And then there was the Eastern AirLines Electra where flight attendants were reportedly wearing phony stewardess wings with the wings broken off. 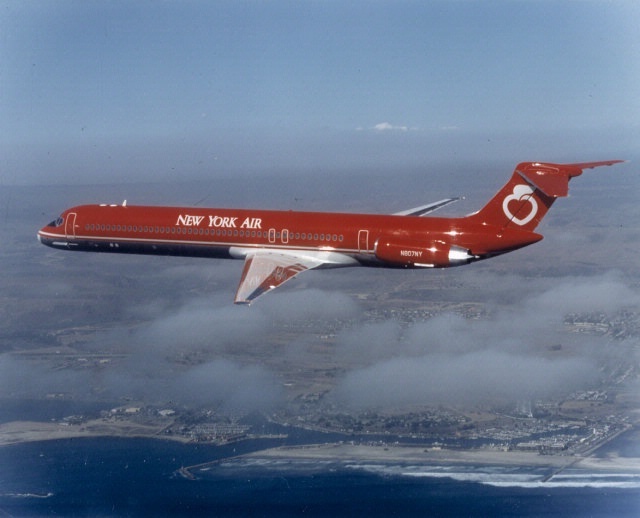 Or National Airlines: “Look Ma, No Wings!” Electra service to Miami. All tests seem to indicate the Electra was basically safe and airworthy at slow speeds. Three days after that Tell City crash, the Feds instead of grounding the Electras, ordered the Electras not to fly more than 275 knots (316 mph).slowed down to the speed of a Connie or a DC-6. The representatives from the from the Northwest accident investigation team reminded the FAA that 275 knots is the speed at which the Braniff Electra was flying when it broke up. The FAA then reduced its top speed to 225 knots (259 mph). 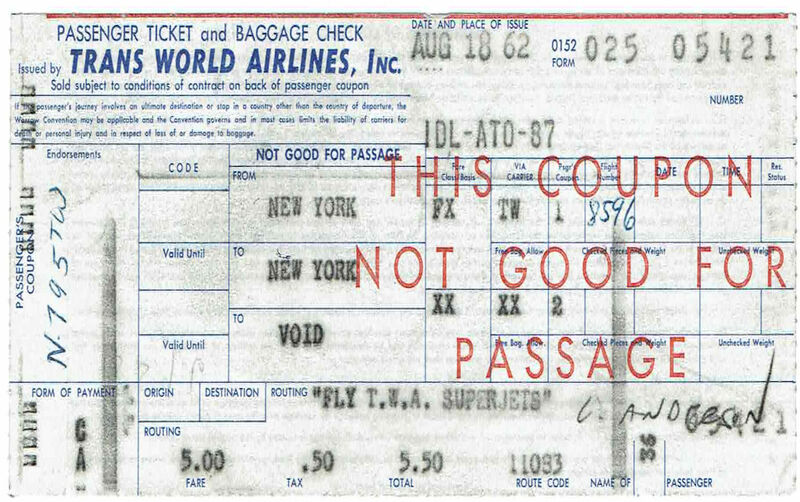 The speed restriction was arbitrary and imposed to give the public more confidence in the airplane. But it didn’t. It would be an economic disaster to ground the whole Electra fleet. 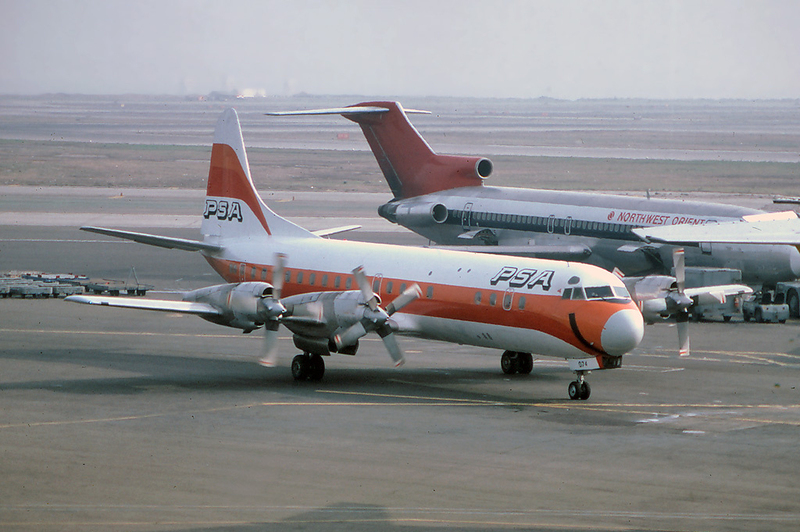 PSA, for example at the time had only four airplanes in its fleet, all Electras. It was an admittedly risky gamble, but the FAA allowed the Electra to fly, but at a much slower speed. Meanwhile, the investigations continued. 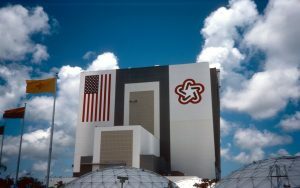 Boeing volunteered staff and simulators to Lockheed. Douglas contributed engineers and equipment. 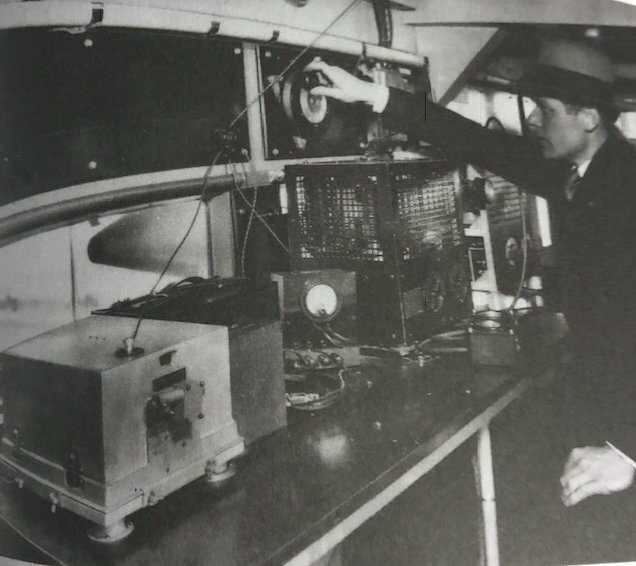 The investigation, occurring in the early 1960s, was the first serious use of computer stress analysis in the field. NASA attempted to re-create the conditions in its wind tunnel. 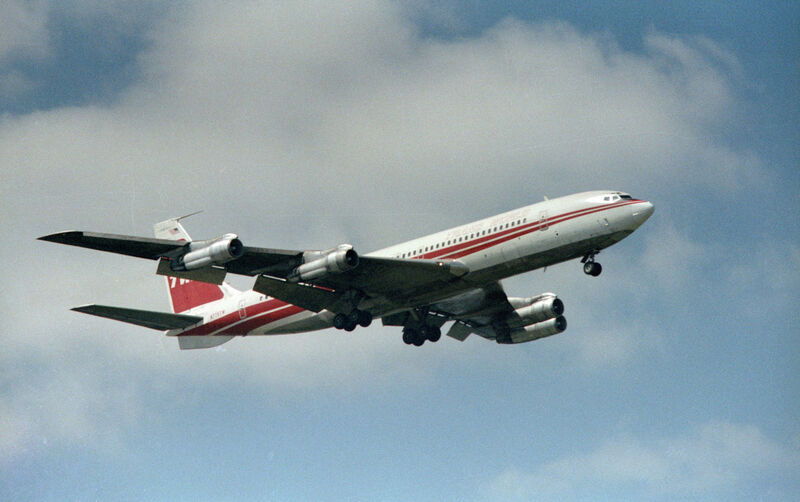 The Electras were flown in every possible form of turbulence. Test pilots rammed it through the Sierra Madre Mountain’s airwaves over and over again. 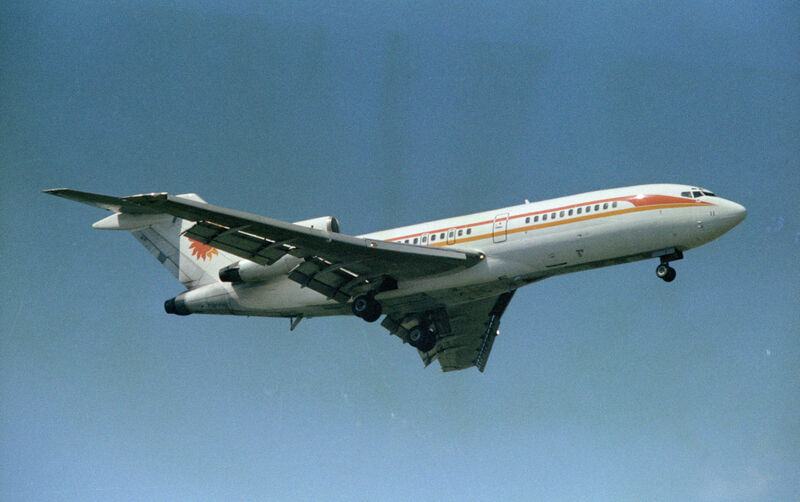 The Electras were put through every possible flight maneuver that may cause a wing failure. Still nothing! Basically, the problem was a high speed aircraft in a conventional design. The Electra’s powerplants were housed in four enormous engine nacelles protruding far forward of the straight stubby wing. It was the two outboard engines that were involved in the Electra’s destruction. Then in May 1960, NASA announced the cause of the accident that took 97 lives. Wing vibration, or flutter, is inherent in the design and is expected. In engineering terms, there are more than 100 different types of flutter, or “modes”, in which metal can vibrate. The mode that destroyed the Electra’s wing was called a whirl mode. Whirl mode was not new, nor was it a mysterious phenomenon. 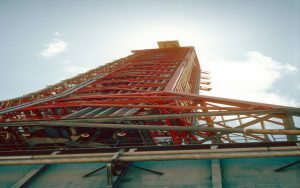 Its a form of vibration inherent in rotating machinery such as oil drills, table fans and an automobile’s driveshaft. The theory was devastating simple. A propeller has gyroscopic tendencies. Engine turbines spin at 13,820 rpm and the propellers at 1,280 rpm. These forces are designed to stay in a smooth moving plain of rotation unless displaced by a strong external force, (just as a spinning top can be made to wobble if a finger is placed against it). Now suppose a force drives the propeller upward. The stiffness that’s part of the nacelle’s structure promptly resists the force in a downward motion. The propeller continues to move in one direction, but the rapidly developing whirl mode is vibrating in the opposite direction. The moment such a force is applied to an engine, it starts a chain reaction. The propellers normal plane rotation is disturbed, sending inharmonious forces back to the wing. The result, if not checked, is a wobbling effect that begins to transmit its motion to a natural outlet: the wing. The wing now begins to flex and flutter, sending discordant forces back to the engine-prop package, which in turn creates more and violent vibrations, feeding the mode new energy. It took less than 30 seconds for the energy to separate the wing. Whirl mode did occasionally develop in propeller-driven airlines. It was always encountered by the powerful stiffness of the entire package, the nacelles in the engine mounting, and the truss holding the engine to the wing. This usually isn’t a problem. But on examination of the Electras engines, investigators found that something caused the engine loosen and wobble causing a severe whirl mode. 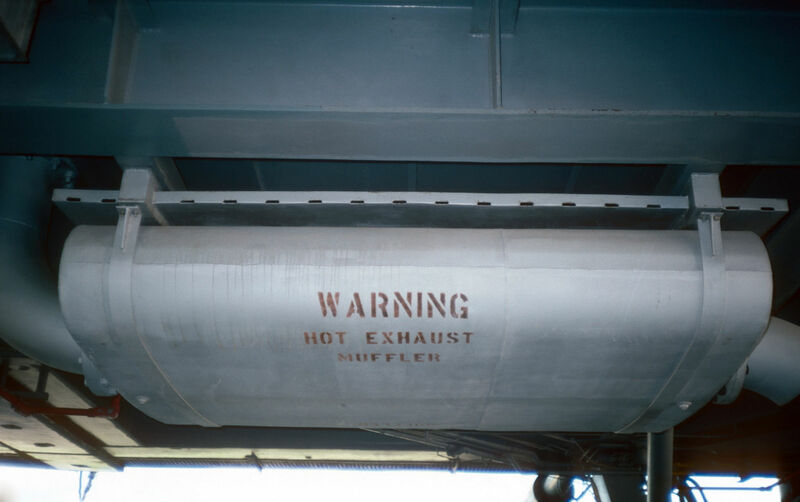 Investigators discovered that the engine mounts weren’t strong enough to damp the whirl mode that originated in the outboard engine nacelle. The oscillation transmitted to the wing caused severe up-and-down vibration, which increased until the wings separated. On the Braniff Electra, they discovered an over speeding prop that produced a particular sound. When a tape of the sound was played to the crash witnesses they verified the sound. Examination of the wreckage found loose and wobbly prop on the left wing’s outboard engine. The world mode caused from the over speeding prop was unchecked by the engine mount. The lucky few who deplaned the Northwest Electra in Chicago told investigators about experiencing a “hard landing.” Tell City had reported CAT. Investigators concluded that the combination of the hard landing and the CAT weakened in the Electras outboard engine mounts. When the pilot tried to pull up and compensate for the turbulence a whirl mode followed, tearing off the already weakened wings. 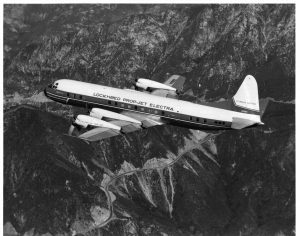 Lockheed began a retrofit program called LEAP (Lockheed Electra Adaptation Program). 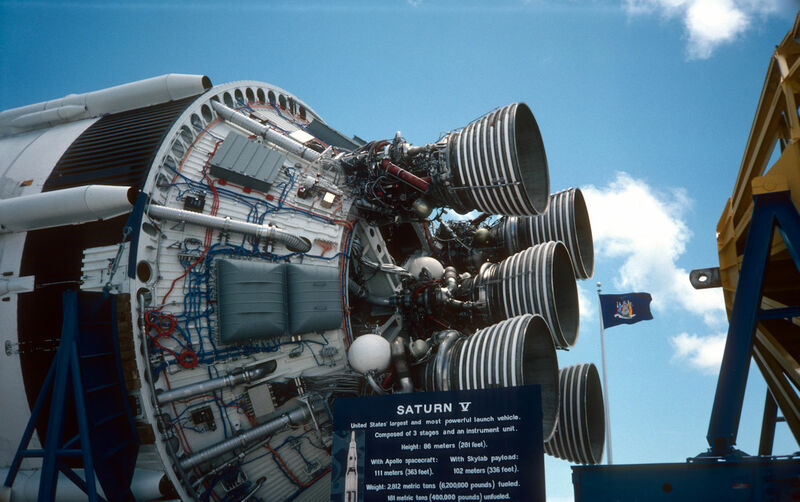 All Electras had their wings strengthened, the engine nacelles reinforced and mount, which was ordinarily a bar, redesign to a strong “V”-shaped to withstand more stress. Electras took to the skies with restored confidence. And then on October 3, 1960, an Eastern Airlines Electra departing Boston for New York, crashed, killing all 72 aboard. Again, a cry went up to ground Electras but this crash was different. A large number of English starlings had been ingested into the Electra’s wide engine intakes. This caused the engines to flame out. The plane lost lift stalled and fell into Boston Bay. Although this problem was serious for all airliners it wasn’t associated with the Electra’s design. But there were more Electra crashes. 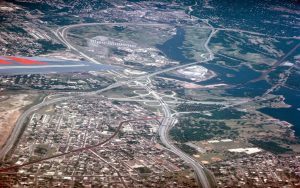 On September 14, 1960, an American Airlines Electra landing at LaGuardia airport tore across the Grand Central Parkway where it came to a stop, upside down. Miraculously all aboard survived. 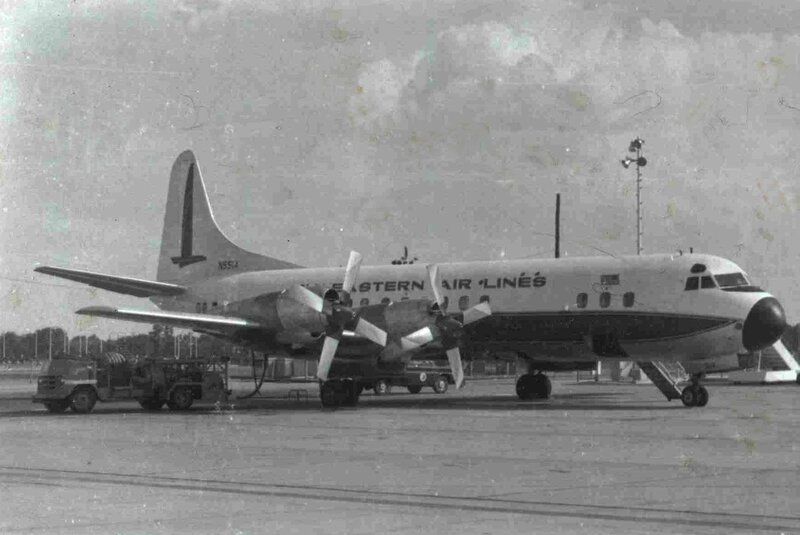 Then on September 17, 1961, another Northwest Electra crash near Chicago, killing 37 people. Neither crash was the result of a design or structural flaw. The first involved excessive landing speed and a skid; the second caused by an improperly placed aileron cable. The majority of the Electras were retired from the major airlines by 1975, but Eastern Air Line’s retired the last one on November 1, 1977. Today the remaining Electras continue as services charters, sprayers and freighters. In 1958, the U.S. Navy replaced their aging fleet Neptune anti-submarine warfare and maritime patrol aircraft with the Lockheed P-3 Orion. Name for the winter constellation of the mighty hunter, the Orion was retrofitted from the Lockheed Electra. The initial P-3 was modified from the third Electra airframe. 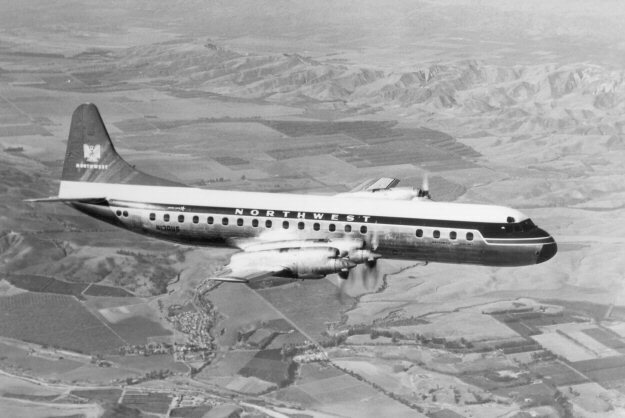 While based on the same design philosophy as the Lockheed L-188 Electra, the aircraft was structurally different with seven feet (2.1m) less fuselage forward of the wings and military additions such as wing hard points, nose radome and a distinctive tail “stinger” for detection of submarines by magnetic anomaly detector. 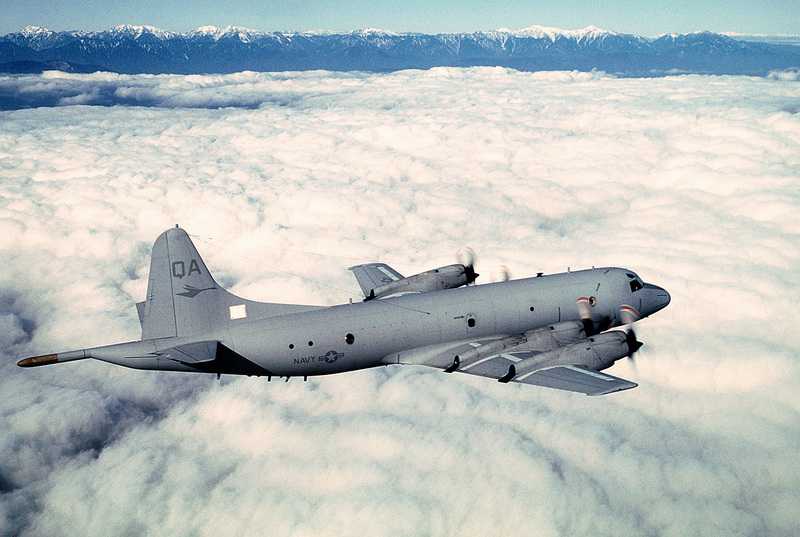 The Navy still flies the P-3 Orion over the long-range landplane and the antisubmarine platform. 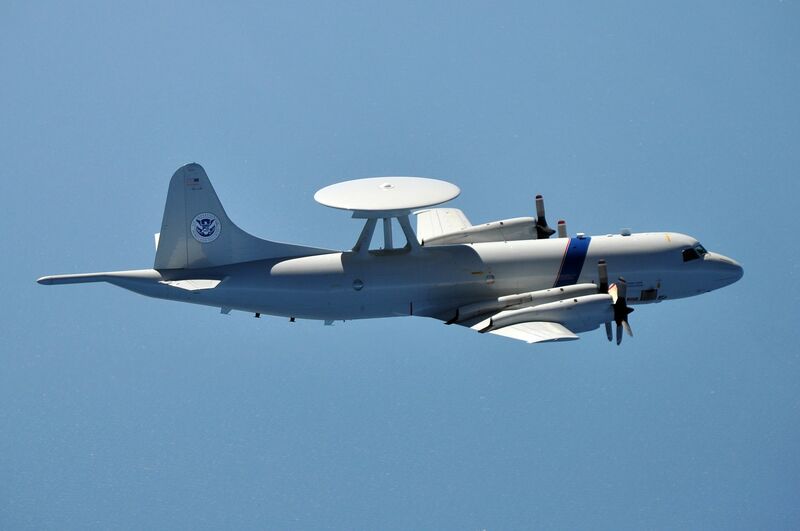 In June 1988, the U.S. Customs Service welcomed to first three Airborne Early Warning aircraft (AEW) into its fleet. They use it as a long-range radar detection platform to perform on the southern U.S. border, Gulf of Mexico and the Caribbean. The aircraft is a distinctive 24-foot diameter rotodome fuselage. 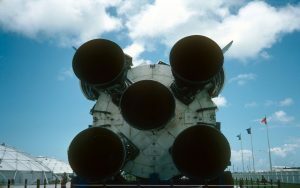 It is coupled with an APS-138 radar system. The Customs P-3 also comes in a second variant without the dome (Slick). The dome can detect targets over land and water in an encompassing 196,250 mi.² per 360° sweep. It can remain airborne for up to 14 hours. 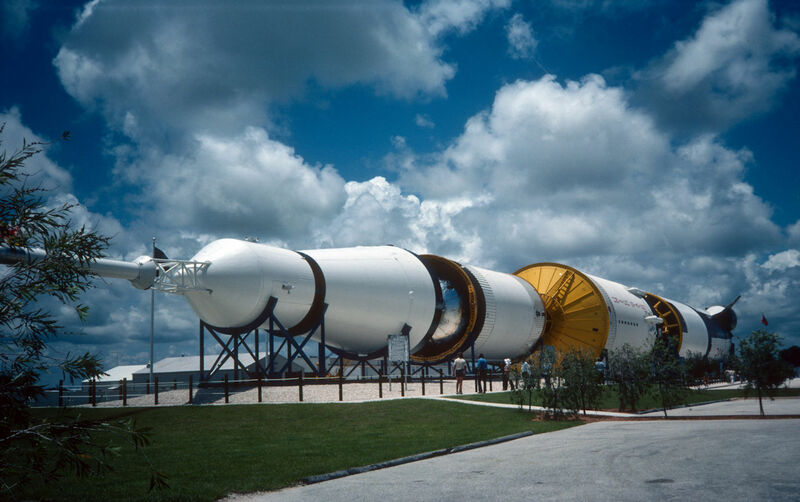 According to Robert Sterling, author of “The Electra Story” Lockheed had made the decision to close the production line March 17, 1960 – just hours before the Tell City crash. Sales had dried up because airlines decided to wait for the short haul pure jets on the drawing board. Once the BAC-111, 727 and DC-9 went into service passengers didn’t want anything to do with props. The two publicized in-flight breakups in the first 16 months of service – Sept 1959 and March 1960 – gave the plane a similar ‘reputation’ as the Comet, the Electra was in trouble. Initially it did not sell well overseas. 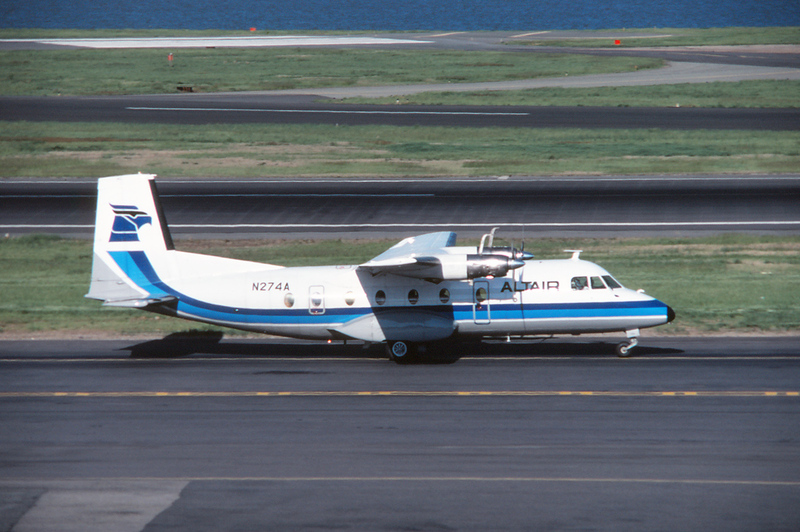 There was strong competition for turbo prop airliners from several manufacturers. 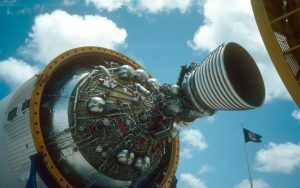 Lockheed shut down the assembly line after only 170 airframes completed with huge losses, estimated at over $50 million. 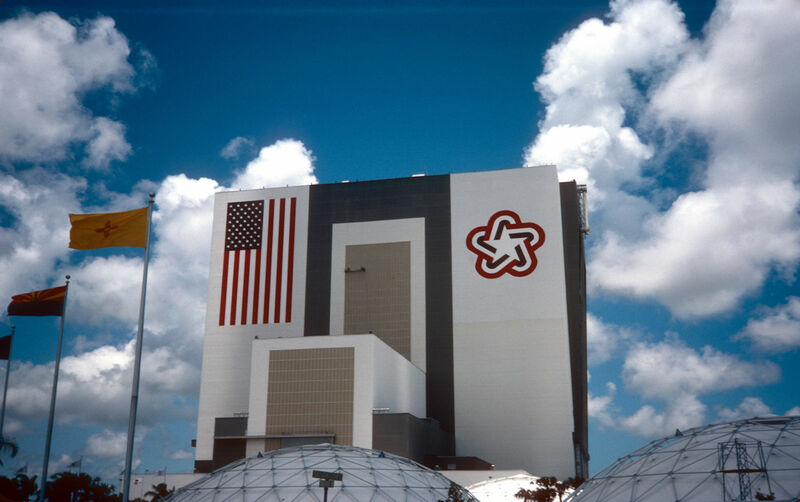 Production ended in 1961, just three years after introduction. According to the Lockheed L-188 Electra Wikipedia.org site, the Electras went on to fly for more than 29 different airlines as freight dogs, sprayers and charters for decades. On September22, 1978, a U.S. Navy P-3B Orion msn 185-5199 registration 152757 went down because of a suspected whirl mode. It is the only military Orion lost to the phenomenon known as whirl mode.